A growing disparity between supercomputer computation speeds and I/O rates makes it increasingly infeasible for applications to save all results for offline analysis. Instead, applications must analyze and reduce data online so as to output only those results needed to answer target scientific question(s). This change in focus complicates application and experiment design and introduces algorithmic, implementation, and programming model challenges that are unfamiliar to many scientists and that have major implications for the design of various elements of supercomputer systems. I review these challenges and describe methods and tools that various groups, including mine, are developing to enable experimental exploration of algorithmic, software, and system design alternatives. 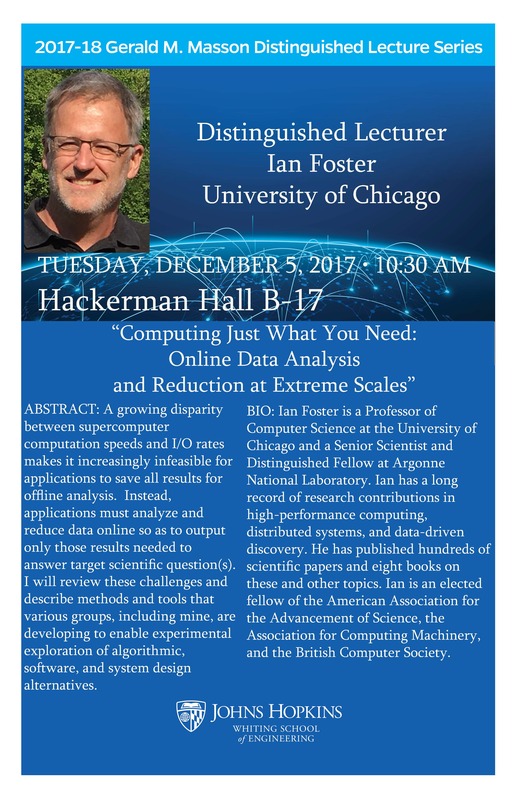 Ian Foster is a Professor of Computer Science at the University of Chicago and a Senior Scientist and Distinguished Fellow at Argonne National Laboratory. Originally from New Zealand, he has lived in Chicago for longer than he likes to admit. Ian has a long record of research contributions in high-performance computing, distributed systems, and data-driven discovery. He has also led US and international projects that have produced widely used software systems and scientific computing infrastructures. He has published hundreds of scientific papers and eight books on these and other topics. Ian is an elected fellow of the American Association for the Advancement of Science, the Association for Computing Machinery, and the British Computer Society. His awards include the British Computer Society’s Lovelace Medal, the IEEE Tsutomu Kanai award, and honorary doctorates from CINVESTAV, Mexico, and the University of Canterbury, New Zealand.